Huatulco pronounced (wah-tule-koh in English) refers to the resort area BahÃ­as de Huatulco or the Bays of Huatulco. Situated 430 km (270 miles) southeast of Acapulco on Mexico's Pacific Coastline in the state of Oaxaca. Bahias de Huatulco is actually made up of a series of nine bays and numerous small coves stretching along 20 Miles of jagged coastline, including 36 pristine white sandy beaches. Huatulco Mexico is divided into four main parts Tangolunda, Santa Cruz, La Crucecita and Chahua. Tangolunda is the most developed area with several restaurants and luxury resort hotels. The Bays of Huatulco are one of the largest ecosystems in the Mexican Republic and have been declared a protected zone to help ensure Huatulco always remains a place where nature can peacefully coexist along with recreational facilities. It is truly an unspoiled tropical paradise where 70% of the area has been designated as an ecological zone. FONATUR (a governmental agency for the development of tourism) and the Mexican federal government have committed to preserving Huatulcos' status as an eco-friendly resort. 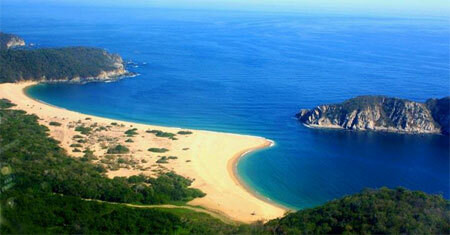 In addition to the spectacular natural beauty, Huatulco has an exceptional level of infrastructure. FONATUR has made major investments in developing paved roads, electricity, and modern water and sewage treatment plants, so that no waste goes into its pristine bays. The commitment to maintaining the environment here is so high that much of the area is protected from future development. The area is also known for its ecotourism. River rafting, rappelling, snorkeling, diving, boat cruises to virgin bays and hiking jungle trails are all on offer and can be booked through hotels or tourist shops. Huatulco has been awarded the Green Globe certification, the only resort in Mexico to receive this prestigious award (Green Globe is the worldwide benchmarking and certification system for the travel and tourism industry across the triple bottom line of economic, social and environmental management).